Please refer to our stock # JM-62 when inquiring. Tea Cup, Yunomi. 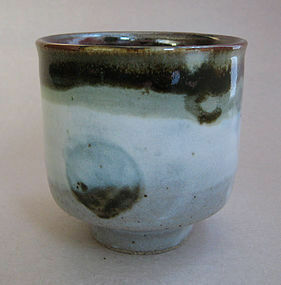 Shino Glaze which has pooled into a Blue Circle on the face of the cup, and Kaki glaze Interior and Rim. John Miller; Portland, OR. H. 3.0"(7.75cm) x Dia. 3.0"(7.75cm.) Vol. 6.75oz (200cc.) John Salgir Miller was born in Elmira, NY, in 1974 and earned his BFA in ceramics and illustration from the Massachusetts College of Art in Boston. He has been inspired the mingei aesthetic and by the work of Shoji Hamada since he began studying ceramics in high school. While at Mass Art studying under Ben Ryterband (who spent time studying pottery in Japan,) he had the chance to see an exhibit of Tatsuzo Shimaoka’s work in Boston and to meet Shimaoka-sensei who gave a lecture on Mingei at Mass Art. This work also had a great impact on John’s pottery style. While taking the aesthetics of mingei and Mashiko ware to heart, he also had close access to the Museum of Fine Arts in Boston, just two blocks away from Mass Art. Here, he was able to further explore the vast world of Japanese ceramics as well as to study the Chinese Song Dynasty pots in the museum collection. Since 1999, he has lived in Portland, OR, where he continues to expand his ceramic skills (studied salt firing with Jim Koudelka at the Oregon College of Art and Craft, 2000 – 2005.) He has shown his work in Boston, Portland, and now Seattle. Besides being a fine potter, John is also an avid cyclist and bike racer, as well as a serious collector of Japanese ceramics and Turkish folk art.